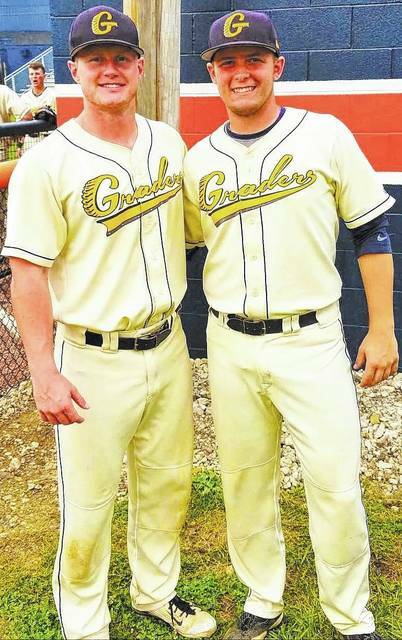 Chad Clinger | Galion Inquirer Brock Balderson (left) and repeat winner Matt Noel (right) are the Graders Greats of the Week for games played July 2-8. Also winning but not pictured was Mansfield native, Brody Basilone. GALION — Another week down in the Great Lakes Summer Collegiate League means more Graders Greats of the Week. It was not an easy week for the hometown squad. The Graders went 2-5 during games played from Sunday July 2 through Saturday July 8. The pitching staff gets a nod this week, to go along with the first repeat winner. Brody Basilone is a 6-foot, 2-inch, 205-pound right-handed starter for the Graders Brody is a senior at Northern Kentucky University and calls Mansfield home. The Lexington High School graduate went 1-0 on the week, picking up the win against the Lorain County Ironmen on Independence Day at Heddleson Field. In that contest, Basilone went six innings, gave up eight hits, allowed two runs to score (one earned), walked two batters and struck out one en route to the victory. Basilone faced 27 batters in his six innings of work, throwing 111 pitches, 72 of which were strikes. Brody was also named the GLSCL Pitcher of the Week for action during week four of the season. Basilone has since been shut-down for the summer. Owning the tail-end of the bullpen is Brock Balderson. Brock is a hard-throwing right-hander who is 6-foot-1 and hits the scales at 200-pounds. Balderson plays his collegiate ball at Butler University and is a junior. This Alliance, Ohio native appeared in two games on the week and picked up a win. On July 4, Balderson worked 1.1 innings, allowing just one hit and striking out a batter to help secure Galion’s win. Brock earned the victory on July 6 when he went two innings against the Cincinnati Steam, not allowing a hit or a run and striking out three of the six batters he faced. In total, Balderson faced 10 batters and threw just 46 pitches, 29 for strikes. Brock will also represent the Graders in the GLSCL All-Star Game at Prasco Park in Mason, Ohio on Tuesday, July 17 at 7 p.m. He will be joined by teammates Austin Hathaway and Jarett Smetana. Matt Noel is the first repeat Graders Great of the Week with his performance during last week’s games. Noel was a remarkable 9/16 (.563) at the plate, racking up six singles, three doubles, four runs batted in and scoring two runs. Matt is a junior at Malone College and calls Tallmadge, Ohio his home. Noel is a 6-foot, 205-pound catcher and leads the team in batting average and hits on the 2017 season. Congratulations to Brody, Brock and Matt for the well deserved honors as this week’s winners! https://www.galioninquirer.com/wp-content/uploads/sites/38/2017/07/web1_Brock-and-Matt.jpgChad Clinger | Galion Inquirer Brock Balderson (left) and repeat winner Matt Noel (right) are the Graders Greats of the Week for games played July 2-8. Also winning but not pictured was Mansfield native, Brody Basilone.